The weightless rig for bass fishing can prove to be worth it weightlessness in gold. 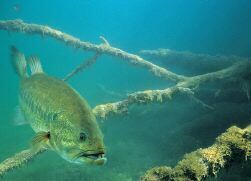 (Sorry for the pun) This bass fishing technique is one of the simplest yet effective methods of catching fish that are in a neutral or negative feeding mood. The action of this rig is completely natural. By letting your soft plastics simple sink on their own, it produces such a perfect look that even the most stubborn of fish can not resist the temptation. I use this technique anytime that the bite slows or the water is heavily pressured. The one thing that this rig will teach you is patience and how to slow it down. I have used this technique in water depths of over 10 feet with very good results. The conditions do have to be favorable in order for this to work correctly but when the wind is low and the bite is tough, it is hard to beat this rig. Calm and clear days do produce the best! Some of my favorite places to use the weightless rig is on the inside and outside of weed lines, under and around boat docks and even in open water when the bass are chasing prey. To present your lure effectively with this rig you need to have a medium light to light power rod with a very fast tip. I prefer a 6’ spinning rod. Bait casting equipment is just too big to handle this type of finesse fishing. Attached to this rod, I like to have a smooth action open face spinning reel. The reel should be balanced with the rod. The reel should also be matched to the rod to create a balanced outfit. Always make sure you match your line to the reel to get the most distance from every cast. Not only will this give you more distance but will greatly improve your accuracy. The line that you should use is very important. I will use the lightest possible line I can get away with. Of course, if you are waters that produce 10 pound fish it will require heavier line to be used. I do recommend at least 8 pound mono that sinks to help the plastic get down to your target depth faster. Mono is a good choice but the new fluorocarbon lines do work very well for this application due to their transparent and strength qualities. This is one of the simplest techniques you can learn. Basically all you do is find your favorite weed line and start fishing. Take your rig and throw it out to your intended target. If you are in deeper water, I like to use a “count down” method. Throw your weightless rig out and count it down roughly 1 to 2 seconds for every foot of water. This method will vary depending on the plastic you are using. My single most favorite lure for this is the senko type worms followed closely by the trick worm. These are just what I like to use, you can try what ever you like or whatever produces the best in the waters you are fishing in. Once you hook that fish, the fight is on and you need to direct it away from any hang ups. Sometimes, this is easier said then done. You will loose fish under docks and trees but my advice is to get right back under there and catch the next one! The weightless rig is basically just throwing your lure to your target and waiting for it to sink to the desired depth. It is very important to keep a close eye on your line while using this technique. Not only are you watching for a bite as the lure falls, but you also need to keep an eye on it once it gets to the bottom. Many times the fish will take this on the fall but they also like it when it is lying on top of the weed bed or the bottom of the water. I good pair of polarized sun glasses may be the key to using this rig effectively. If you can not see your line, you will not see the bite. Very often you will pick up your line by lifting the rod and there will be a fish there. Set the hook, get it into the boat and get back out to that spot again. You may have just located a school of fish and the action is about to pick up even on the toughest of days.